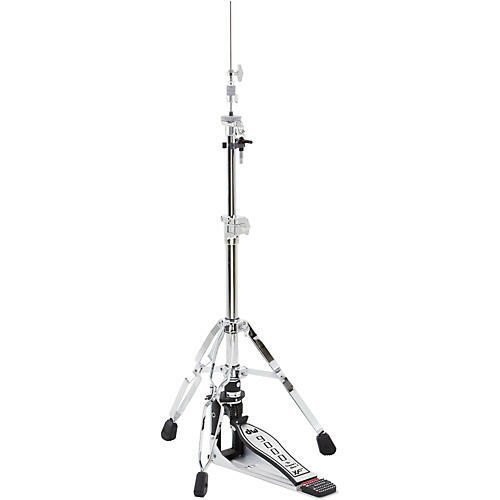 A full-featured, 3-legged hi-hat stand of DW quality. DW 9000 Series Hi-Hats utilize a patented Double Eccentric Cam (shown left) that increases the sensitivity of the footboard in relation to cymbal movement, resulting in a unique, incredibly fast and responsive feel. The Infinitely Adjustable Locking Spring Tension feature (also shown left) allows for precise adjustment to offset the weight of the top cymbal, creating a customized feel. Patented features also include the Lateral Cymbal Seat. A first in hi-hat design, this cymbal seat allow instant access for adjusting the bottom cymbal angle. The SM379 Locking Clutch comes standard and allows you to dial in closed "sloshyness" and lock it so it doesn't come loose. At the base of the stand, a uni-body Folding Footboard stays attached to the base casting when secured in the folded position, while a high-tech Ball Bearing Hinge provides smooth, quick action.